Home » Blog » Considering a New Year Detox? Your Body is Already On It. 3 Reasons Why That Juice Cleanse May Not Be as Healthy as You Think. Considering a New Year Detox? Your Body is Already On It. 3 Reasons Why That Juice Cleanse May Not Be as Healthy as You Think. Detoxing—most of us have heard of it, and a handful have probably attempted it. But it turns out this fad might not be as beneficial as some would have you believe. Outside Online recently featured some of the reasons doctors and scientists say you should put down the juice and consider some tried and true alternatives instead. Given over 80% of nutritionists say detoxes are bogus, it’s better to focus on staying hydrated, eating healthy food, exercising regularly, and getting quality sleep. There are plenty of wellness celebrities who swear by their solstice cleanses. Yet, when over 80% of nutritionists say detoxes are bogus, you may want to consider other options. The idea behind detox or a juice fast is eliminating virtually all solid substances so that your body can cleanse itself. However, when you do this, you’re not just depriving the body of toxins, you’re also eliminating nutrients that help drive detoxification in the first place. For example, when you stop consuming proteins, the body also stops synthesizing glutathione (one of our bodies main detox enzymes). Therefore, by starving the body of both good and bad enzymes, detoxification halts altogether. Detox juice cleanses also reduce intake of much-needed dietary fiber, another critical factor in your body’s built-in cleansing functions. Registered Dietician Robin Foroutan says it best: “the body detoxifies on its own, or we would be dead in days.” The truth is, our bodies are constantly encountering harmful chemicals that can contribute to poor health, but our bodies are on the defense before they cause permanent damage. We have built-in detoxifying abilities and are constantly transforming toxins through biochemical reactions, allowing us to expel them with our bodily fluids. In other words, provided your exposure to chemicals isn’t excessive, you can trust your body to do what is needed. If you do feel you’ve been exposed to concerning levels of chemicals, talk to your doctor for testing instead of jumping into a cleanse that may do more harm than good. “Detoxification” techniques can actually break down tissues that you need for strength and energy. Many people detox to lose weight quickly or jumpstart their energy levels. What they don’t know is that “detoxification” techniques can actually break down tissues that you need for strength and energy. Therefore, you may be taking three steps back in terms of strength and endurance, hurting yourself in the long run. There is no shortcut to weight loss or getting healthy—it takes time, persistence, and determination. Be patient and focus on putting healthy food into your body, drinking plenty of water, exercising regularly, and getting quality sleep. These are the keys to good health. If you’ve been working hard to change habits or lose weight and have come to a halt in progress, it can help to work with a professional. We’ve long been trusted to provide Rancho Cucamonga patients with weight loss solutions that work. 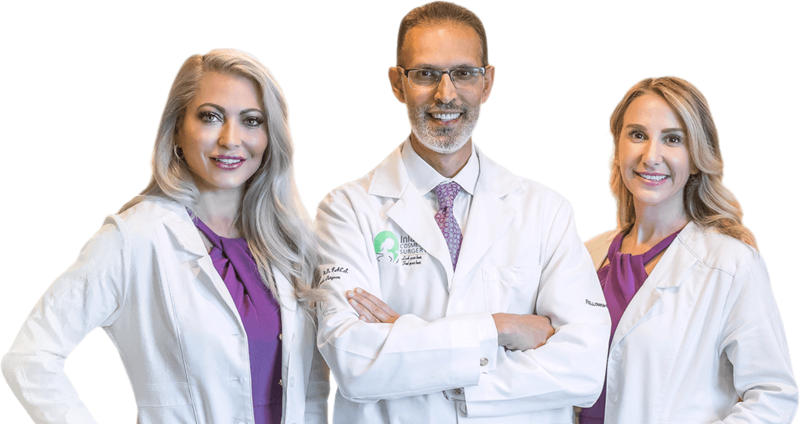 Whether you’re looking for a body contouring procedure, non-surgical weight loss option, or are trying to learn whether you’re a candidate for a bariatric procedure, we’re here to help.